No need to turn on the stove and heat up the kitchen with this chilled soup. 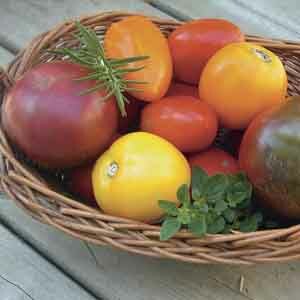 Simply pick some fresh vegetables from your garden and blend them together! In blender or food processor, combine tomatoes, tomato juice, celery, garlic, half of the: cucumber, green pepper and onions; the hot pepper sauce and salt. Process until vegetables are finely chopped but not pureed. Stir in remaining cucumber, green pepper and onions. Refrigerate until chilled. Use herbs from your garden to add layers of flavor to grilled foods. A fresh supply of herbs make the tastiest marinades and rubs.